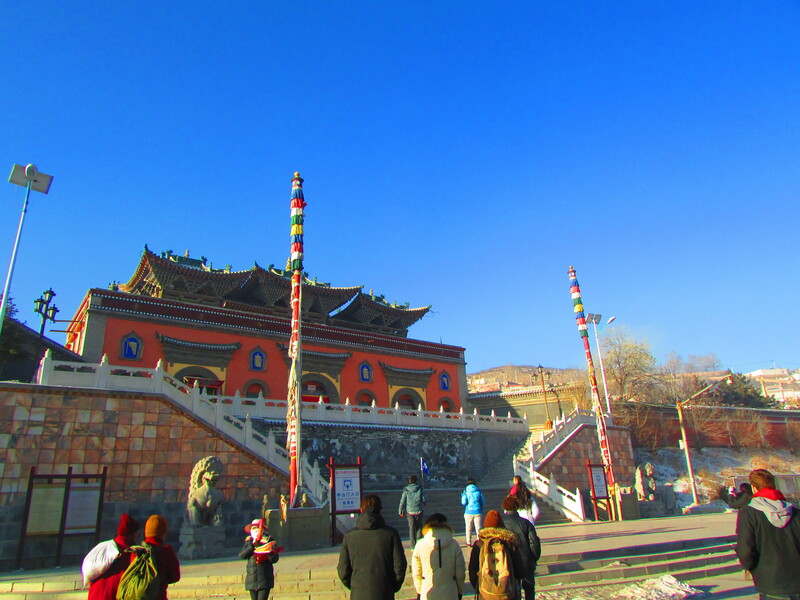 Before boarding the train to Lhasa and the Tibetan Autonomous Region proper, we had to see Kumbum Monastery. Kumbum provided the first real glimpse into the traditional Tibetan culture and religion that all of us had heard so much about. 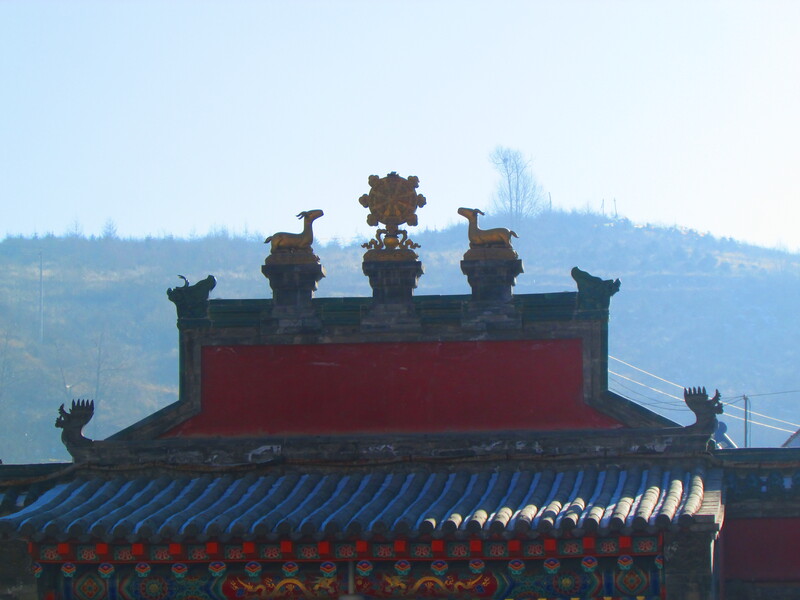 Few places matter more to the Yellow Hat or Gelug sect of Tibetan Buddhism than Kumbum Monastery. Voices in media often speak of Tibet as one entity held tight by one faith. The reality has a few more grits to sort through. Tibet once had heavier pagan or shamanistic beliefs but these seriously started to lose prominence when one of Tibet’s great dynastic kings, Songtsen Ghampo took over. Songtsen was no small talent, quickly taking control of much of the Tibetan plateau and patronizing the region’s early Buddhism. Eventually he would even rout the forces of the Tang Dynasty. Later on the Bon faith would arise in contrast of Buddhism, though it could never get quite as hard a hold. 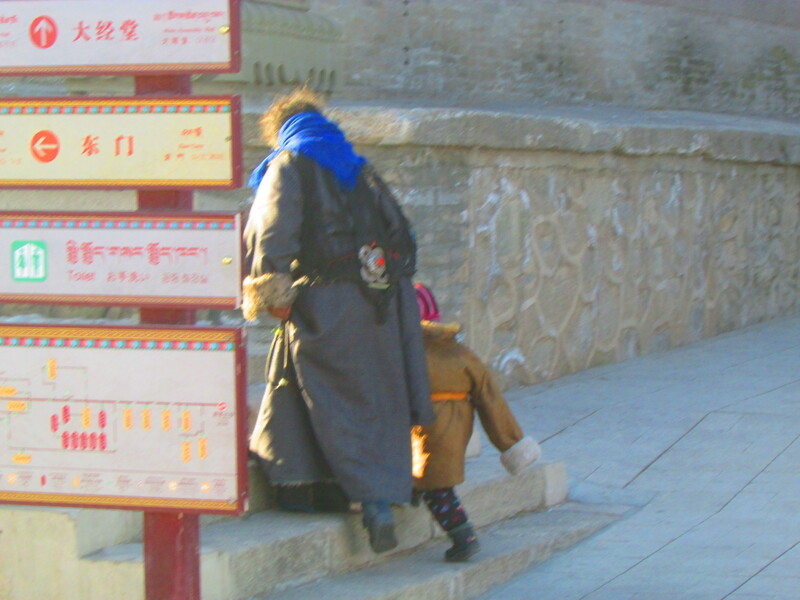 Tibetan Buddhists themselves could not quite agree on everything and splintered into several sects that rose and fall. 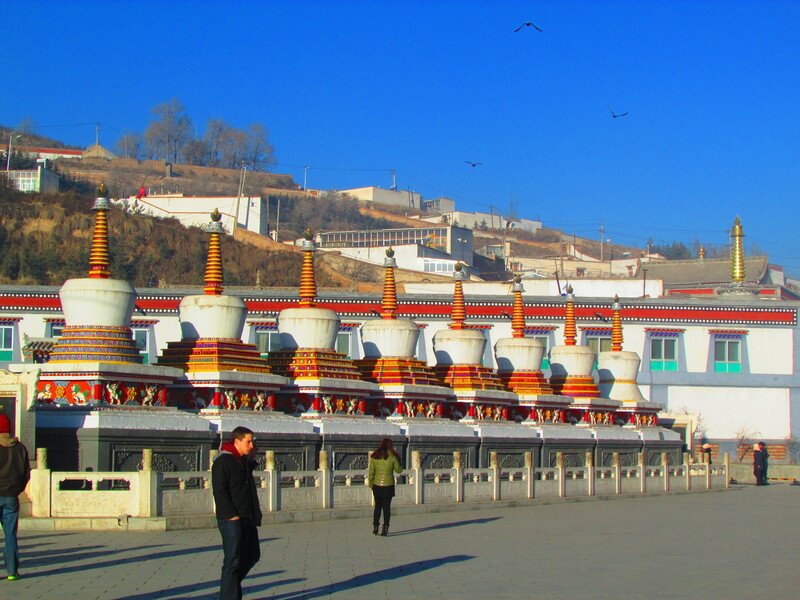 The Dalai Lamas and the Gelug School now iconic across all the world started up in the 14th century with Tsongkhapa and a small town outside Xining that would become Kumbum Monastery. Our bus wheeled up to the outer wall of Kumbum early in the day, just as it opened. We had all layered up but the cold winter morning could cut through any number of layers. The whole place was quiet except for us shivering and chattering. For a while everyone just stood outside, waiting for a signal from our guide to head in. An eager salesman with a plucky grin spotted us. 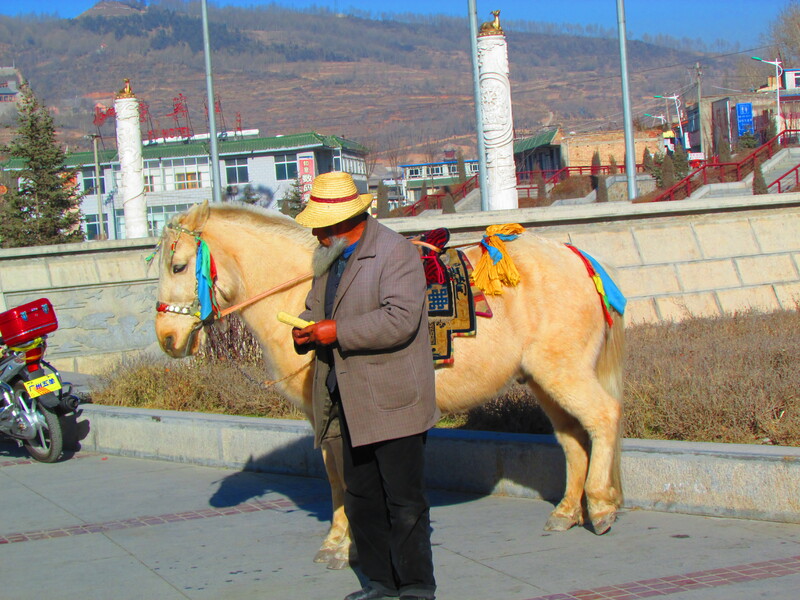 He had the reigns of a shaggy white pony in his hands and offered rides for anyone willing to pay. None of us were much pliable to the offer, though. As tourists we likely disappointed, not buying from the stands of handcrafted goods outside or opting in on pony rides. 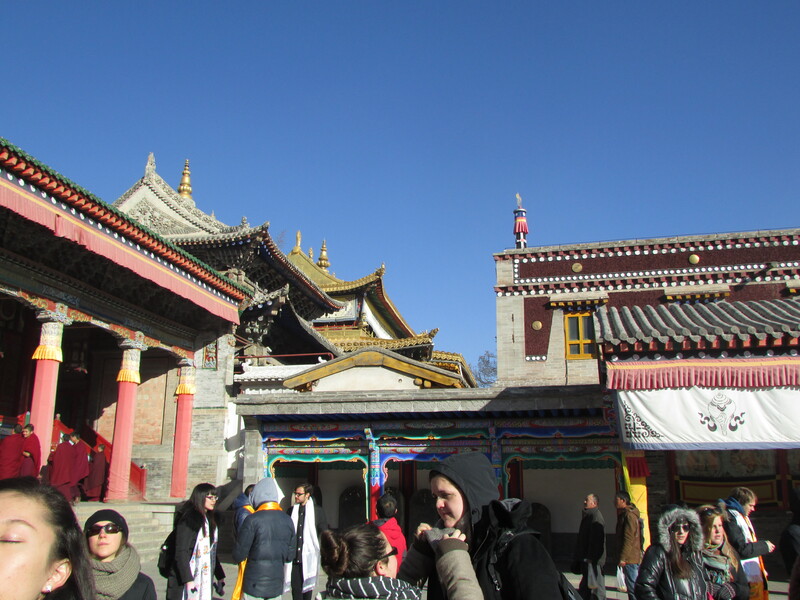 Most of us were saving up for Lhasa, a place bubbling with commerce and worship. Aside from our group Kumbum did not have so wide an audience this early in the morning. A Tibetan woman and her kid came walking in with us and there were a few other folks scattered about. I do not doubt that, come a little later time, the place would get a bit more active. Still, Kumbum was a monastery slightly removed from the really big population center, so it may never have had so many worshipers as monks. The sparseness of the monastery added to it anyways, at least for a visitor from far off. Generic holiness as I knew it always had this idea of solitude surrounding it. Generic holiness shows itself in form of a person alone in a church atoning, like in the movies. 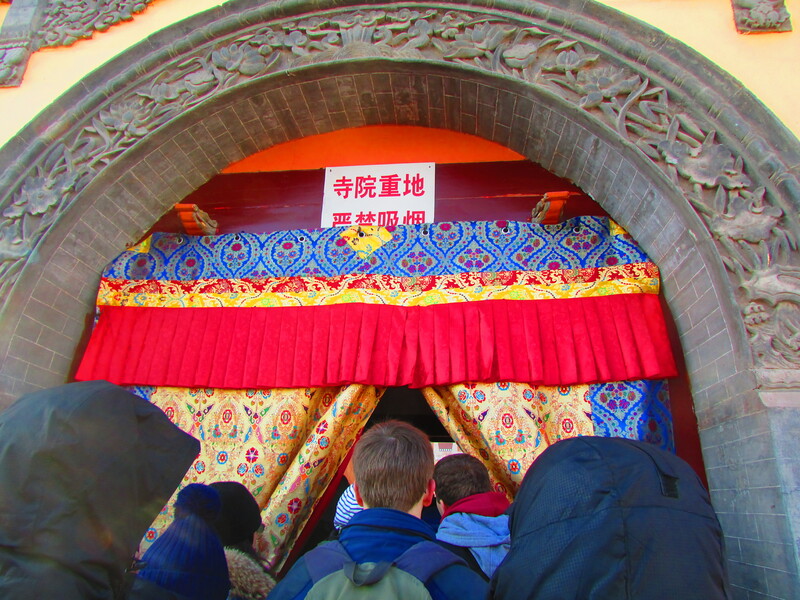 Yet if there was anything that the Yonghegong monastery in Beijing and my sometimes unstable routine of bible study taught me, it’s that faith and religion come alive when people come together underneath it. The people make the faith as much faith makes the people. That dialogue with an idea of something holy or unworldly good was always what gripped me. Still, Kumbum easily shined through the biting morning cold and everything else that kept attendance away did not mean much. The monastery gradually wove upward into the side of slightly sloping mountain. The sharp red, gold and greens burst to life in the sunlight and from that moment I could feel myself romanticizing everything. I fought against that urge. I love the romantic but it can really run against you if you really want to grip something. Red arches welcomed us into the monastic compound. Our long linger in the cold came to an end with a row of white stupas topped with colorful spirals at their tops and intricate colored patterns at the bottom. 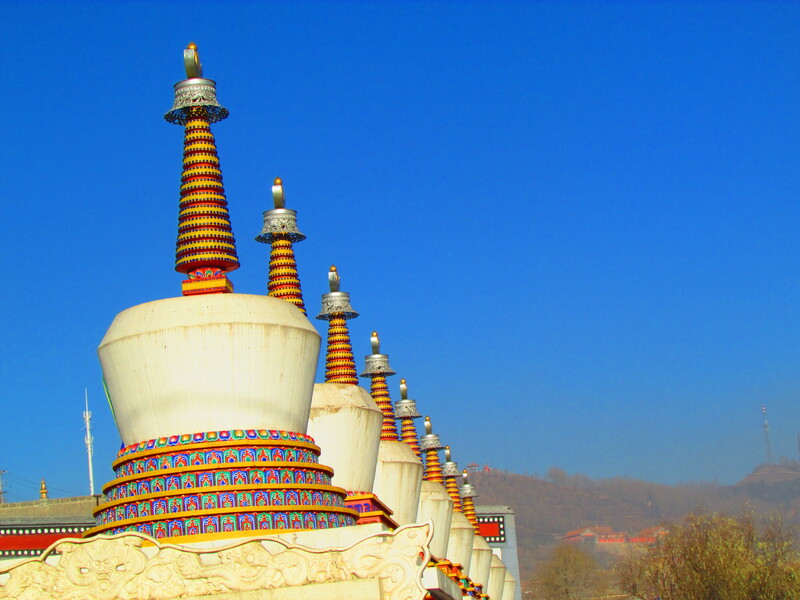 Each stupa represented a different part of the Buddha, Shakyamuni’s life and teachings. The sun shined down and the tour guide led us further in. First we visited a few rooms on the outside of the complex, shrines to various religious figures. We could not take pictures inside and unfortunately my memory cannot hold all the specific images. Still, the colors in all the temples, the deep reds and oranges stitched into so much incredible quilt work, and the glimmering gold of mighty statues has not left me. Rather, the colors just bleed into a mess of mixed images that won’t separate for all my pulling at them. We walked through the thick and brilliantly colored cloth that covered the thresholds of some of the shrines and dropped small donations as we went. Sometimes we got shawls in payment for a donation. They feel thin to the hand and would not combat the cold, but they have beautiful color and decoration. They came with a meaning too, red for passion and love, orange for prosperity, and so on. Even with the meaning attached the shawls reminded me that I was as strange as a person could be to this place, separated by layers of culture thicker than a thousand of these shawls. The tour guide showed us complex statues made from Yak butter, and important offer given to Tibetan temples and monasteries, before we walked off the beaten path to somewhere deeper in. Along the route we ran across some monks making their way into the main complex where we would soon be. They worse Nikes and eagerly eyed their smart phones. It might seem a sharp contrast, but Buddhism and Capitalism do not often clash so much. Even before capitalism ever came about, any religious order needed money and resource to stay alive. Often those resources had to come from the surrounding towns, the monks and abbots too busy with holy scripture, prayer or meditation to manage all on their own. So monks in many places lived as a privileged class funded through heavy donation. My father never pushed Buddhism very hard on any of us, but he had demystified it for me. Buddha does not wipe away the little terrors people feel. Even monks stay human, eating human food, finding human shelter, at least until the accounts say they burst into clouds of lotus flowers. Like any religion Buddhism could coexist alongside anything from something as small as smartphones or as sinister as fanatical violence. I was glad to see monks in Nike’s as another reminder to not fetishize faith.